food politics | poor scientist. will blog 4 food. Barry Estabrook’s Tomatoland has been on my “To Read” list ever since it came out last summer. I first got a glimpse of Estabrook’s talent for investigative journalism when I read his piece on Kobe beef (“Raising the Steaks”). His writing piqued my interest, and a subsequent Google search led me to his blog Politics of the Plate, where he writes about the political and environmental consequences of our food production system. It was there that I first read about tomato farming in Florida. The article, “Politics of the Plate: The Price of Tomatoes”, is what laid the foundation for the book Tomatoland. So when Estabrook came to San Francisco last summer and was part of a round-table discussion at CUESA, TC and I attended. We learned a lot, not just about tomatoes, but about the farming industry in general from local, organic farmers and from a workers’ rights advocate. So why did it take me so long to read this book? Well, the short answer is: I’m cheap. I wanted to get it from the library, so I ended up waiting months for the one copy in the entire Oakland Public Library System. Fortunately, it was worth the wait. 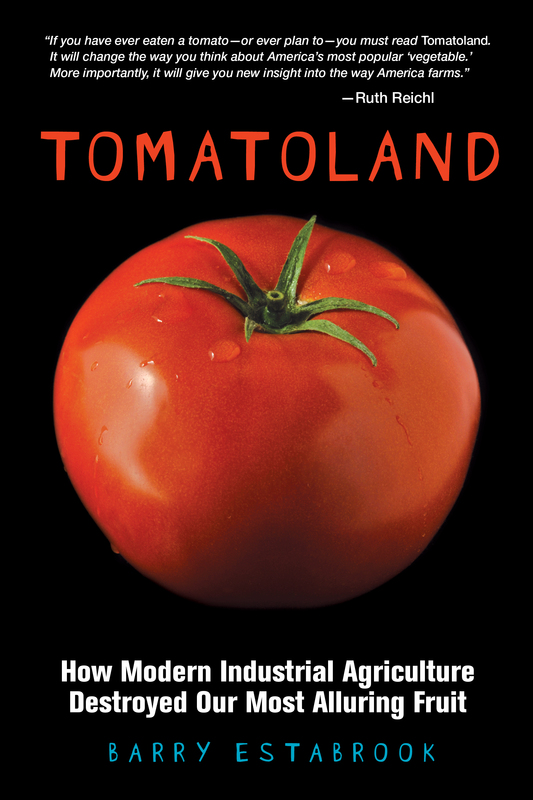 Tomatoland is a fast read, and an engaging and thoroughly researched collection of essays. It focuses not only on food politics, but also on food science, anthropology, and the future of tomato production in the United States. Estabrook does a great job painting each person in the book as real individuals, not as caricatures. I won’t lie — there are plenty of depressing stories in this book. You will most likely come away never wanting to eat a winter tomato from Florida ever again. However, Estabrook doesn’t just leave you with a laundry list of problems; he also gives readers hope. For instance, there’s a chapter that’s dedicated to the people who are actively making a difference. I really value that aspect of the book because I think that it’s relatively easy to write a doomsday book, but it’s much harder to research, analyze, and communicate what the solutions to those problems might be. 1. The commodification of agricultural products is one of the major problems with our current food system. Case in point: Florida tomatoes are not grown for taste, but rather for uniformity of size and ability to withstand harsh conditions, so that they can be packed and shipped easier. For some reason, many of us will eat winter tomatoes, even though they taste like nothing (or worse, mush), just to have something red on our salads and sandwiches. The demand for year-round tomatoes has also resulted in farming practices that resemble chemical warfare (e.g., the average farmer uses over 100 chemicals to grow Florida tomatoes), as well as forcing workers into modern-day slavery. The one piece of good news is that, as farmers’ market heirloom tomatoes are rising in popularity, American consumers are realizing (and demanding) fresh, vine-ripened tomatoes that might look a little weird but are way more tasty than their conventionally grown cousins. Let’s hope that this trend continues, not just for tomatoes but for all of our produce. 2. Chemicals aren’t just bad for you and the earth, but they’re very harmful to farm workers. For a long time, the reason I bought organic food was because I didn’t want to expose my body to any unnecessary chemicals. I also didn’t like the effect of herbicides, pesticides, and fertilizers on our environment. What I failed to consider, and what I credit this book for reminding me, is that due to unsafe practices, the workers who grow and pick our produce are highest at risk for exposure to toxic chemicals. The horrifying story of these babies born to 3 women who worked the tomato fields during their pregnancies should be enough to make everyone consider buying pesticide-free produce. So, as it turns out, buying “local, seasonal, organic (pesticide-free)” isn’t just good for you and good for the earth, but it’s also good for the people growing the food. Sounds like a win-win-win to me! Categories: Books | Tags: Barry Estabrook, book review, food politics | Permalink.